Boho Hostel i St. Julians, Malta: Bestill nå! 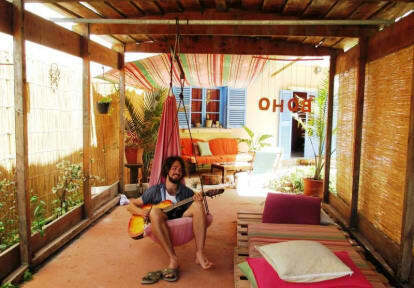 If you're a Bohemian traveller, you've found your Bohemian hostel. Drop off your bags and relax in Boho; a hostel which is ideal for backpackers & solo travellers due to its genuine social atmosphere and backpacker vibe. Located in a lovely Villa & Garden, Boho offers the perfect escape from the city’s main busy central strip, while still being only ten minutes away on foot from it. Blessed with a large garden and courtyard, and that ever-constant Maltese sunshine, Boho is simply a pleasure to wake up in and a lovely home-away-from-home to retreat to. What's more, it's a great base to meet other travellers to explore the island with. Being backpackers ourselves we know what you're after when you're staying in hostels, and being locals we know where the good stuff really is! We provide you with detailed Maps, plenty of info on Malta, and we can also help you plan your itinerary. We also organise regular activities like BBQs and island hopping. In other words, you're guaranteed a great time in an environment which is as chilled-out as it is fun! CHECK IN is open daily from 8:00-13:00 & 18:00-01:00. Please always email the hostel with your arrival time, especially if you're coming in between check in hours (afternoon), or landing late, so we'll make sure staff is here to greet you. Guests checking in past 1am are required to pay a late arrival fee of €10, and are requested to inform the hostel of their late arrival upon booking. CHECK OUT from 8am to 10am. Age Policy: 18+ Please note that we accept both cash and card payment upon arrival. Payment with Credit cards are only accepted when guests books a minimum of 3 nights.